If you are like me and have kids, you are well aware that sometimes they say the most imaginative and funny things. For example, my family and I recently visited Montana and one of the unique landmarks there is called the Sleeping Giant. It is a big mountain that looks like a giant laying on its back sleeping (see picture below). My son Quinn was quite excited to hear that he would be getting to see the Sleeping Giant. Upon seeing him, Quinn exclaimed "Wake up Sleeping Giant! Wake up!" This was soon followed by "Hug?" Those moments seem unforgettable but, all too often, many of them fade after a few years. Next, enter the number of kids you have along with their Name, Age and Month. Save it. When you save it, It will ask you to enter the child's quotes below. You can select the name of the child from the dropdown and enter the quotes in the provided field below. Select the Save button and you can view it in "View My Kids Quotes" link. It's that simple. Quickly add as many as you like. You will be thanking yourself a few years from now when you are reminiscing together with your family and having a good laugh. We will also be adding the List feature to rememberstuff.me Notes in the near future, so, that will be an option to use, as well. 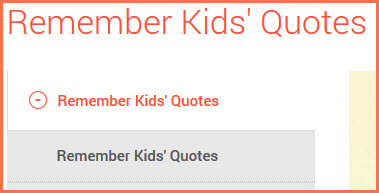 So start to enjoy, saving and remembering your kid's crazy or cute quotes at quotes.rememberstuff.me! Save Your Child's Artwork Online! Are you finding it tough to find a place to keep all your child's artwork? Feel guilty just throwing it away? You can use use Remember Stuff to save pictures of those creations. Just snap a pic with your phone and it is saved forever without cluttering your house or your digital photo albums. In addition you can save your kids favorite quotes, create chores lists, and more!